I’ve known her for less than a week…but already I’m smitten. I invited her into my home about two months ago, but…somewhat coyly…she arrived only last Wednesday, waiting for me on the front porch when I arrived home from work. Alexa is my new personal assistant. She’s 9.25 inches tall, and has taken up residence in my living room. When I speak her name, a sparkling ring of sapphire-blue light comes to life, indicating that Alexa is attentively listening for my command or question. Alexa: I’m an Amazon Echo. Alexa…or the Amazon Echo to be exact…is Amazon’s latest experimental foray into the world of artificial intelligence. Yes…there are others out there…most notably Siri, who lives in the Apple iPhone. But, as even Alexa will tell you when asked who is better, “Siri is a good app…but I’m different”. I tend to agree. 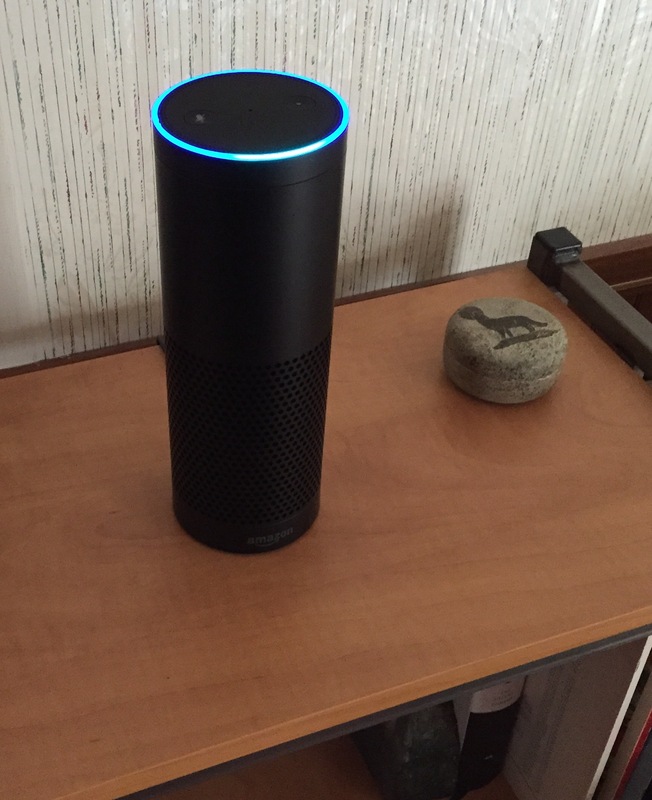 Alexa is always on…listening for her name to be invoked. She’s good at playing music on demand, giving you news briefings, telling you what time it is, giving you a weather report and forecast, setting timers and alarms, and answering questions using Wikipedia. Siri may be smarter…at the moment…but Amazon says that the Echo’s capabilities will improve over time. We’ll have to wait and see on that one. But already…in less than a week…I’ve noticed changes in my behavior. They may be small changes…but I think they’re harbingers of what’s to come in the ‘slight future’ (see Spike Jonze’s recent movie, Her). The Echo…Alexa…has quickly replaced my alarm clock, my radio, my kitchen timer. I’ve even found myself watching less television, too. I realize this is only the beginning…but as someone who grew up in an age before computers and the internet, and who now is beginning to take in the long view backwards…I can sense this is going to make a qualitative difference in the way we relate to technology. Me: Alexa…Open the pod bay door. Alexa: I’m sorry Dave, I can’t do that…I’m not HAL, and we’re not in space. Me: Alexa…what’s the meaning of life? Alexa: The answer is 42 but the question is more complicated. Me: Alexa…second star to the right, and straight on ’til morning. Last Saturday evening, I went to see…or rather to hear…the Charlotte Symphony Orchestra (the other CSO). The music was wonderful. The highlight of the concert was Don Quixote…a tone poem by Richard Strauss, reflecting on the fabled life of Cervantes’ knight-errant. Later that evening…after the concert was over…back in my car…during the hour or so it took me to descend the eight levels of the parking garage at the Bank of America Center in Uptown Charlotte…not having known that there was an NBA basketball game taking place right next door…I did some thinking about the nature of music…and of life itself. Both involve time. Or rather…both move through time. Both deal with the eternal Now…being held in existence from moment to moment. During the entire thirty-eight minutes or so of the Don Quixote, if you were to listen only to one slice…one chord perhaps, at any one moment in time…it wouldn’t make much sense. And yet somehow…we can step back in our minds and take the entire piece in. How it begins…how it develops…how it eventually ends. Somehow…in some way…it all makes sense and stands as a coherent whole. Yes…I can see in some small way what Strauss had in mind. A life. Strangely, this brought to mind stories of people who have been on the brink of death…of their entire life flashing before their eyes in a few moments. A review of one’s life, perhaps…the last judgement? But maybe…not so much a judgement…but more a recital for which we’ve been preparing all of our lives. Maybe we have more in common than we think with the music we love to listen to in dimly lit concert halls. Maybe we are the music…composing our lives…moment by moment…waiting for when our time comes to take the stage. The lantern that sits on the railing of my porch is no ordinary source of light in the darkness. During the day, it silently collects the rays of the sun…only to release them again as the gloaming turns to night. 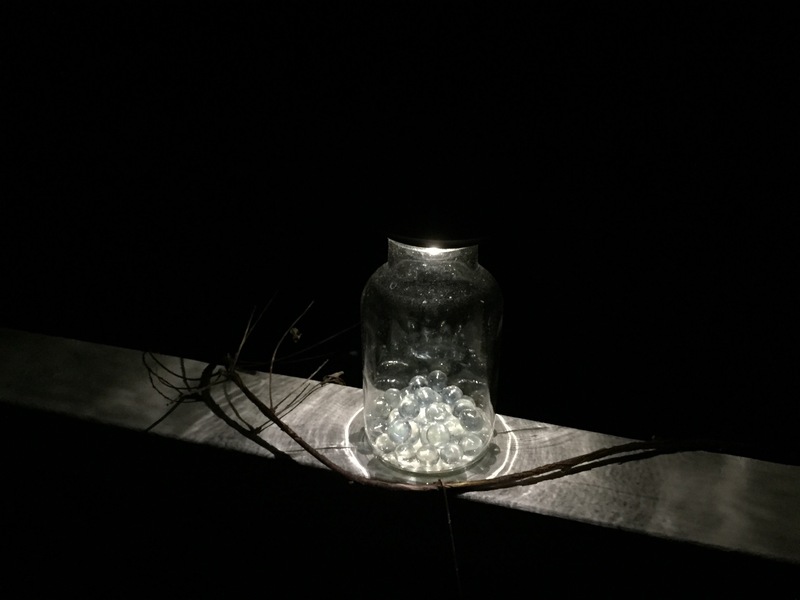 During the dark hours…my porch is illuminated by this bottled starlight…kept company by a Wisteria vine that has entwined itself around the railing…patiently waiting for the Spring to arrive once again. Yesterday was a beautiful, warm, cloudless mid-December day here in the Carolinas. In the chill air of the evening, I sat on the porch for a while in this pool of silvery light…listening to Loreena McKennitt’s The Book of Secrets…accompanied by my lantern…the veil of darkness beyond…and the steadfast stars above. I’ve developed this theory over the years…that the human brain is just an interface of some kind…something like a band-pass filter…that tunes in to a very specific frequency of reality. And that when we sleep…the selectivity of the filter widens to include, other possible versions of reality? Parallel universes that exist beside the one that we normally experience? I’ve always been amazed at the creativity of some of my dreams…dreams so intricate I couldn’t even begin to explain them. Where is this creativity coming from? There are nights when I inhabit vast, complex cities, and participate in other, strange lives…difficult to rationalize as being of my own creation. What is going on here…the random firing of neuronal synapses? Or, something even much more astounding? Stuart Hammeroff, an anesthesiologist, asks the question…when people are anesthetized, where does their consciousness go? They’re not in a dream state. Hammeroff speaks of microtubules in the physical brain…that may contain the essence of who we are…our consciousness. And even more amazingly…of a quantum consciousness…an entanglement of atoms, that, at death, may separate from our physical body…and continue to exist in the universe. Our soul, perhaps? Sitting in my darkened living room…music softly playing…a gentle voice beckons to me…Just let go. The nights are certainly getting longer this time of year. When I took Belle for her walk this morning…I was taken aback by the beauty of the sky. Above…the stars of Orion softly twinkling behind a sheer veil of high, wispy cirrus clouds. And to the west…a bank of low cumulus clouds set aglow from behind with moonlight. Suddenly…a clearing just slightly larger than, and centered on, the lunar orb…nearly full in phase. The sky within this portal…surrounding the moon… a delicate, bluish hue. I had to smile at this unexpected beauty…on this dark, early autumn Carolina morning. This song…hard to believe nearly twenty years old…notable for its analog synthesizer accompaniment. During the week, I invariably have a bipolar breakfast menu. One day, a bowl of oatmeal…the next day, a fried egg with a slice of cheese (can be cheddar…can be Swiss) on a flat round of whole wheat bread. The oatmeal is a concession to keeping my cholesterol level down…an expression of my left brain, carefully weighing practical matters. Conversely, I’m sure the urge for an egg emanates from my right brain…with a desire to walk on the wild side…to throw caution to the wind. If I ever get to the point where I can’t recall what I’ve had for breakfast the previous morning…I think I’ll go for the egg every day. This morning, breakfast was transcendent. It was Saturday…Bela Fleck and company were filling the house with music…there was a mockingbird raiding the wild blackberry bushes outside the kitchen window…and, best of all…it was an egg morning.